It is time that schooling globally accepts, as an underlying operational premise, that schools are different. With change as the new normal, that difference will become increasingly so. Let’s cease operating on the largely unquestioned and dated premise that all schools are the same. Let’s understand by changing that long honoured underlying premise, the shaping mindset, one fundamentally changes all one’s dealings with schools. That said let’s also recognise that schools, like all other digitally based complex adaptive systems (Dooley, 1997), will evolve over time in a remarkably similar manner while at the same time as being different. In marked contrast to the traditional paper based organisation that was designed for a world of relative constancy and continuity the digitally based organisation is designed to facilitate rapid on-going change, digital disruption, seeming chaos and accelerating evolution and transformation. Where sameness prevailed in the former, difference will be the norm in the latter. The most advanced organizations will become champions for change, harnessing the latest developments to grow and improve the business (Accenture, 2016. P8). One of the realities of the Digital Revolution, and a digital and socially networked society is that every digitally based organisation – be it a business, a public utility, a public service unit or a school – will evolve at its own rate. Very quickly organisations within the one area of endeavour will in their digital evolutionary journey continually transform their nature, culture and ecosystem, and do so at varying rates, with the successful soon becoming very different to their slower moving counterparts. The rate of the digital evolution will be strongly impacted by the leadership of its chief executive officer and his/her ability to create and grow a digitally based and socially networked ecosystem and culture that will provide the clients/customers the products and services they desire (Westerman, et.al, 2014). The more successful move to the fore, the less successful will trail until such time as they are able to surpass the productivity of the digital masters and those unable to compete cease to be viable. It is very much Digital Darwinism at play (Lee and Broadie, 2016,2). Each organisation will be at a different evolutionary stage, with the differences between like organisations on trend to continue growing at pace. Think for example of the differences between the digital technology companies, and the productivity of their ecosystem and corporate culture. While the likes of Apple and Google are evolving at pace, organisations like Microsoft, HP and Acer are daily seeking to transform their operations to better compete, the likes of Nokia, Blackberry and Yahoo – all former digital masters – are slipping out of the play. Contrary to the belief of some there is little governments can do to curtail Digital Darwinism – even if it was desirable. The same – unseen to many – is happening with schools worldwide. Schools have to go digital to remain viable (Lee and Broadie, 2015,5). As evermore schools move to the digital operational mode the digital masters – the pathfinder schools – will continue to evolve at an accelerating pace, the later adopter schools will seek to follow, while those wedded to the ways of the traditional paper school will move closer to a state of equilibrium and questionable viability. In the 2016 edition of The Taxonomy of School Evolutionary Stages (Lee and Broadie, 2016, 12) we identified seven key and distinct school evolutionary stages, understanding that every school sat at a point on that evolutionary continuum. Schools operating at the Digital Normalisation evolutionary stage are very different organizations to those at the Early Digital. Indeed in many respects the mode of schooling provided in the former is antithetical to the latter, so great is the difference. In brief schools are already very different. It is the new reality – the new norm – that should be borne in mind in every school related operation. Schools are not and should not be regarded as the same. Moreover they have not been the same for at least the last decade, since the first of the schools moved to a digital operational mode. Notwithstanding most educational administrators and governments still work on the premise that schools are not only the same, but will remain so for years to come. Globally one sees authority’s continuing to apply a common standard to all its schools. You’ll have seen how national and regional politicians view all the schools the same when they seek to impose their magic panacea on the schools within their bailiwick. It is as if sameness is the key to readying the young for a rapidly evolving uncertain future in a digital and socially networked world. They are actively encouraging the schools to be different. What impressed in examining the evolution of the pathfinding digital schools was how successful the astute principals were in taking advantage of that autonomy in shaping schools – markedly different, ever evolving schools – that would provide the ideal education. One is left with the very strong impression that the vast majority of governments and educational administrators – and most assuredly their bureaucrats – are not aware how strongly their operational thinking is shaped by the premise that all schools are – and will – and probably should always be the same. One can but hope they see the error in their thinking and that in supporting semi autonomous schools go digital they adopt a digital mindset (Bhaduri and Fischer, 2015) where organizational difference is the new norm. In shaping your school’s digital evolution it is imperative you take charge of your school’s growth (Lee and Broadie, 2016, 4), understand your school is unique and that you will need to adopt a shaping strategy that suits your situation, regardless how different it makes your school to others. rnessing the latest developments to grow and improve the business. This entry was posted in digital schools, Elementary and high school evolution, Implications school evolution, school differences, school digital ecosystem, School evolution on November 7, 2016 by mallee. At a time when the Australian Government is espousing the importance of highly agile innovative organisations, the digital technology is transforming all manner of organisations and schools are moving at pace to a digital operational mode it is critical Australia’s school libraries and teacher librarians take advantage of the opportunities opened. 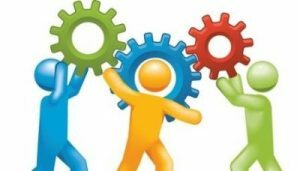 They need move quickly and proactively to ensure their contribution is central to the workings of rapidly evolving, increasingly integrated schools. There is now a clear understanding in all organisations, including schools, that organisations have to go digital to remain viable (Lee, 2015). The efficiencies, economies, benefits and enhanced capability of the digital organisation far surpasses that of the traditional paper based operation. Moreover there is the growing recognition that all digitally based organisations, as complex adaptive systems will continually evolve (Pascale, et. al. 2000), and will do so more rapidly, taking advantage of the digital convergence to become evermore integrated. They will abandon their old ‘silo like’, ‘loosely coupled’ (Weick, 1976) structures and discrete operations, and adopt an increasingly integrated and networked form. The word ‘critical’ was chosen carefully. ‘Silo like’ school libraries that sit alone, operate largely autonomously, that are perceived to be paper focussed and removed from the core workings of the school can be readily dispensed with in the creation of more tightly integrated and productive school ecosystems. To thrive and to continue making a significant contribution in any rapidly evolving digital organisation – be it a company, university or school – the library and librarian need play an integral and lead role in the organisation’s workings and its on-going evolution. Most schools have been slow to move to a digital operational mode but teacher librarians have only to talk with their colleagues within the pathfinder schools, business and the public sector to recognise the pattern of change. School libraries and teacher librarians need to position themselves where their service is perceived by the principal and staff to be central to the school’s vision, operations and growth, and where the role played grows and evolves naturally – and largely unwittingly – as the school’s total ecosystem matures. That is easy to say, but it is difficult to achieve, particularly when the principal lacks vision, digital acumen and the willingness to lead. It is appreciated most teacher librarians now have as their focus the teaching, with little interest in the macro workings of the school. However the stark reality in most schools and education authorities is that unless the teacher librarian looks after his/her own situation, has a sound appreciation of the macro workings of the school, its vision and its digital evolution and is proactive and positions the information services at the centre of all operations no one else will do so. Accept the folly of trying to defend the bastions against digital evolution. Recognise that by being proactive you can assist in shaping the desired future, and lessen the risk of becoming a digital casualty. The experience of the pathfinder schools suggests the following could assist that quest. It is not personal. It is natural to feel that. The Digital Revolution is simply impacting you. Understand the macro workings of the school. In tightly integrated school ecosystems it is vital all staff, teaching and professional support – and not just those atop the apex – understand the macro workings of the school, able to contribute as professionals to its growth (www.digitalevolutionofschools.net). Appreciate the evolution of complex adaptive systems. Those with a science background will already understand the importance, but all staff need to recognise the implications of working with seeming chaos and constant change, and the new order the disturbance creates. Thrive on chaos. Embrace and promote a culture of change and support all one’s colleagues in their work, continued growth and evolution. Adopt a digital and networked mindset. Grasp the marked contrast between analogue and digital thinkers provided by Bhaduri and Fischer (2015). Then you’ll appreciate why a pathfinder school in a networked society has chosen to ‘outsource’ its e-book services to the local library. Integrate the school ‘library’ and ICT services. Move to the centre of school operations. Look to the kind of iCentre model advocated by Hay (2010, 2015) and have it play a lead role in the digital workings and evolution of the school. Support the principal’s leadership. Provide the principal, the staff and the wider school community the on-going support and information services they will need – as well as supporting the students. The Digital Revolution is daily occasioning immense on-going organisational transformation that could, unharnessed hurt many. School libraries and teacher librarians are on trend to be hurt badly, unless each teacher librarian genuinely collaborates with his/her colleagues and the school leadership in positioning the school library’s programs and services at the centre of the school’s digital evolution. Hay, L (2015) ‘The evolution of the iCentre model: Leading inquiry, digital citizenship and innovation in schools.’ Teacher Librarian, 42 (4), 15-19. This entry was posted in digital evolution, digital schools, digital transformation, Elementary and high school evolution, Evolving school ecologies, ICT evolution in schools, networked schools and society, School evolution on May 16, 2016 by mallee. Near a year on from first mooting the idea of a hub and spoke networking model of system wide change, (Lee, Morris and Lowe, 2015) the authors can look back with considerable professional satisfaction at what has been achieved – intentionally and possibly unintentionally – in the last year and what is in store for the next. working with the existing resources in the school and its community. The response from the schools involved affirms there is no need, or call to employ the traditional, specially funded, expensive, much hyped and largely ineffectual ‘one size fits all’, centrally administered change model, invariably out of touch with each school’s particular needs. Indeed the irony is that the efforts to use the centrally administered technology failed as a result of its inability to meet the technology needs of the region. The importance of the ‘hub’ school in the model is from the authors’ experience very considerable. That school needs to open the eyes to what is possible, to what is possible in an everyday school using the existing funds, and to support the other schools in the network, at least with their initial steps. It was also important the program had the support and involvement of the local education authority – in this case the NSW Department of Education – and even though the grant provided by that authority was small it did communicate it’s commitment to the digital evolution of the region’s schools. The unintended – or at least underestimated – part of the model that became increasingly important was the development of a regional – a Far South Coast – digital ecosystem, and its projection of a culture of change. What became increasingly apparent was that while each school needed to grow its own digitally based ecosystem the school’s evolution could be markedly assisted by it being part of a regional digital ecosystem – within a wider culture – that held technology and schooling wise anything was possible. That wider ecosystem provided all the schools, small and large, authentic links with their community, local industry and government, which promoted partnerships that, supported each school’s digital evolution. One can extrapolate further and suggest the impact of the networked change model would be enhanced by a national ecosystem that also encourages innovation and the astute use of the digital in a culture of on-going change. While still early days it is noticeable how well received have been the calls by the national Turnbull Government to create agile ecosystems that can assist grow the digital economy. The schools soon recognised the educational benefits and ease of moving from their traditional, insular silo like mode and becoming increasingly socially networked schools, able to reap the opportunities opened by normalising the whole school use of the digital, and by networking with like minded schools the community. Unintentionally the regional digital ecosystem, with its embrace of the digital, its promotion of the teaching of coding, it ties with the region’s digital industries and local government, the promotion of a local software industry and the conduct of an array of digital and STEM initiatives placed the school growth within a wider, very real world context. The staging of coding workshops for women, robotics competitions and hackathons all helped reinforce the importance of the schools embracing digital evolution and improving the life chances of their students. In regional communities the leaders in the schools, the principals, teachers, parents are also invariably the leaders of the regional initiatives, thus serving to strengthen the growth of both the schools and the wider community. Mal Lee suggests in ‘Digital Schools Grow Digital Communities’ (Lee, 2015) that in a digital and networked society the impact of digital schools spreads well outside the school walls and that in growing the digital capability of its immediate community the school benefits from a more digitally aware clientele with ever rising expectations of the school. Unwittingly the swift embarkation of a critical mass of the region’s schools on their digital journey coupled with the regional digital ecosystem initiative has placed considerable pressure on the slower adopting schools, and in particular the region’s secondary schools to follow suit. So important has become the regional digital ecosystem that the authors would now urge its development be factored into any future hub and spoke networking system change model. In reflecting on the change that has occurred within the schools of the region since the introduction of the hub and spoke networking model, and in particular since the staging of the stimulus conference at the hub school in August the authors have had their observations affirmed. When one notes the change that has occurred since July when the schools revealed their then situation in a pre-conference survey, the requests for assistance fielded by the ‘hub’ school, the observations of the regional director and acting regional director of schools, the post conference survey of participating schools conducted in November and the nature and response to the regional Teach Meet conducted in late November one is looking at significant and rapid evolution. Fifteen of the thirty four – or approximately half – of the schools of the DEC schools that attended the Broulee PS ‘Building a Digital School’ conference responded to the follow up online survey sent out in November, providing an invaluable insight into the impact of the conference, the effectiveness of the hub and spoke networking model and the likely nature of the region’s schools digital evolutionary journey. Impact of the ‘hub and spoke school networking model. The impact of the hub school in the networking model was and continues to be pronounced, with virtually every response commenting on the conference’s stimulating impact or the impetus it gave existing efforts. Digital vision. Tellingly virtually every response commented on their identification of a digital vision for their school. In opting to collectively speak to the concept at the conference we were aware that traditionally in schooling one plays up the shaping education vision, but building on the research undertaken on the digital transformation of business, and the imperative of having a digital vision we advocated schools do the same. The responses point to the widespread acceptance of the concept. Digital evolutionary journey. There was a universal appreciation that each school was on an on-going evolutionary journey, where the way forward had to be shaped by the school and its context. Think holistically. All but one school recognised the imperative of addressing the way forward holistically, simultaneously addressing a suite of interconnected human and technological factors. Gone was the idea that digital evolution was simply about buying the latest technology. Addressing the basics. Again all but one of the schools had embarked on the quest of ensuring the fundamentals to digital evolution like an apt network infrastructure, campus wide Wi Fi access, digital presentation technology in each room and staff having and using the technology in their teaching were in place. School website. Of note was the proportion of the schools that had begun work on creating their own website, and foregoing the ‘cookie cutter’ model. Dismantling of the ICT Committee. The strong message about getting rid of the traditional stand-alone, volunteer ICT committee in favour of factoring the use of the digital into the everyday workings of the school and having professionals lead the way and govern the shaping of the desired digital ecosystem had clearly cut through. Library/ICT restructure. While not addressed explicitly at the Broulee conference it was notable the number of schools that commented in the survey on their plans to restructure their present library/ICT support arrangements in favour of the more integrated iCentre model. Technology coach. Allied was the number of the schools that mentioned moves in creating a technology coach. Teaching coding. Of note was the number of schools, primary and secondary that flagged their intention to tackle the integrated teaching of coding from the early childhood years onwards. The message about needing to ready the school for BYOT came though, with schools mentioning the work to be done and several planning a phased introduction. Ripple Effect. Significantly there was a return from a primary school not at the Conference that had by word of mouth contacted the hub school to assist in shaping its digital evolutionary journey. One of the undoubted benefits of the hub and spoke networking model is the unbridled social networking occasioned, and the associated ripple effect that can create a positive tension or dissonance that promotes further innovation. Primary School Digital Evolution Faster than Secondary School. The overall survey response is further affirmation of the research undertaken by Lee and Broadie (2014) that in general terms primary/elementary/prep schools will, for a variety of factors, evolve faster than their secondary counterparts. 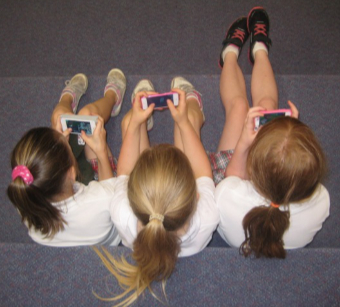 The global trend, affirmed in this survey, is that pace of digital evolution in the primary schools will increasingly see Year 6 students who have normalised the 24/7/365 use of the digital transitioning into Year 7 classes where generally the use made of the digital is appreciably lower, and sometimes unfortunately the student’s personal digital toolkit is banned. Conscious of the challenge of networking a group of teachers spread sparsely over a geographic area nearly the size of Scotland, a region that encompasses the Snowy Mountains through to the coastal fringe and which takes hours to traverse, the hub school decided to take advantage of the video conferencing facility in NSW DEC schools and to conduct a largely online teach meet (http://www.teachmeet.net) combining the more customary face to face with the online and making use of four geographically convenient locations. It had tried to use Google Groups but soon found the local education authority’s central office blocked ready wider community involvement. The hub school convened the initial Teach Meet – the ‘un-conference’. The meeting was held at the day’s end, with teachers at each of the regional gatherings enjoying the host’s afternoon tea and the chance to compare notes with like-minded colleagues. Short, conference follow up presentations were made by six of the schools, with folk able to question the presenters as needed. What was revealing was the energy, the belief that anything was possible, the amount that had happened and that which was planned, and the extent to which the schools had not only taken charge of their own growth but also the networking of the region’s schools. When asked who would like to convene the next meeting several schools volunteered. Tellingly all the networking and support afforded the region’s schools since the August conference has been done with the existing resources, with the schools collectively taking charge of the growth. The survey was done using the free version of Survey Monkey and the Teach Meet took advantage of the existing videoconferencing. Of note in the school’s strategic planning is the increasing use being made of the opportunities provided the regional digital ecosystem and each school’s own networks. What we have witnessed on the far south coast of NSW is a school change model that very consciously makes use of the digital and networked world to provide an apt education for that world. It would appear to be a model a variant of which could be used with minimal cost anywhere in the networked world. This entry was posted in digital evolution, digital transformation, Elementary and high school evolution, Evolving school ecologies, Hub and spoke networking, networked schools and society, Primary school evolution, System wide digital school transformation on January 19, 2016 by mallee.